I have a pretty simple problem but i cant seem to able to figure it out. This works perfectly, and i can access computers on both sides from both sides. *Our ERP software is hosted in the US, we are in UAE and going through a VPN makes things load a LOT faster. Now Site B works perfectly, i can access site A and our ERP traffic is routed just fine as well. Site A however cannot access computers on Site B.
and i cannot figure out why. If Site B can reach site A why cant Site A reach site B. So an update to this situation. I am able to ping computers on site B from site A when logged into pfsense terminal. Now I'm 100% sure its some firewall rule which is not allowing computers from Site A to reach Site B. Below is how my Lan rules are set right now. 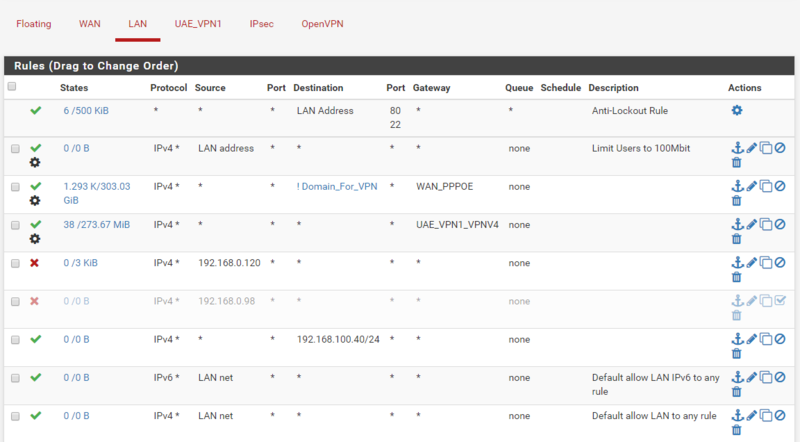 Show Site B OpenVPN Firewall Rules tab. Site B OpenVPN and assigned OpenVPN Interface Tab? and now i am able to connect to all computers on Site B as well as pfSense on site B. That's how im taking these screenshot atm. I don't get the assigned OpenVPN Interface Tab part. I see the OpenVPN Interfaces is your PIA stuff. So I've just read through your problem again, you had your Site-to-Site connection A/B fully working and the problem with A can't access B started with adding PIA as OpenVPN Client, right? Generally speaking for most scenarios with VPN providers you want to enable the Don't pull routes option in your OpenVPN client. Also check out https://www.netgate.com/resources/videos/openvpn-as-a-wan-on-pfsense.html - very great hangout! Maybe you can grab some useful tips & tricks for your PIA. Troublesome could be your any-any Firewall Rule in the OpenVPN Tab. You allow any traffic PIA is sending in your direction there!